Ms. Manasa Gowda, Assistant Professor of Journalism and Mass Communication at St. Claret College, was awarded the Sahapedia-UNESCO Fellowship at the Convocation held in SanskritiBhavan, New Delhi recently. Ms. Manasa Gowda was awarded the honour for her project work on Channapatna Toys, which she completed successfully with able assistance from her mentor D. Ram Raj of Hubballi as well as students Sijo George and K.B. Sachin. According to Sahapedia sources, 130 Fellows graduated in the ceremony. The call for Fellowship proposals received over 500 applications. 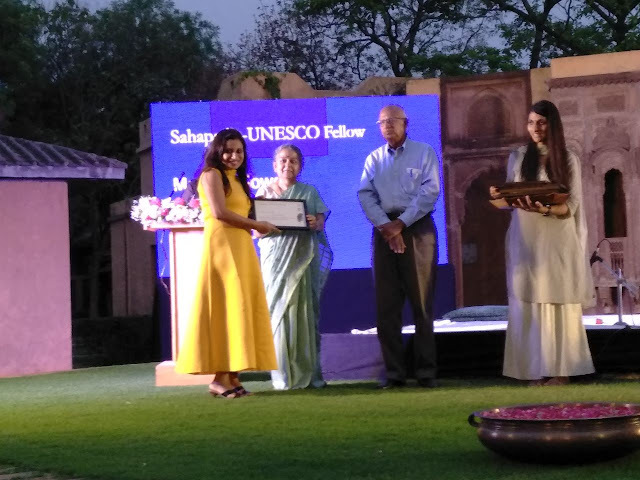 Sahapedia-UNESCO Fellowship is a collaborative project to encourage fresh research on tangible and intangible heritage across India and South Asia. Articles, videos, interviews and more, supported by the Fellowship, are freely available for everyone to read, watch and hear at www.sahapedia.org.